The stellate ganglion nerves travel along both sides of your spine. They are associated with a wide range of bodily functions that you don’t consciously control. These include blushing, heart rate, sweating and the dilation of your pupils. In preparation for the procedure, you lie on your back. You are given medicine to make you feel relaxed. The skin and tissue of your neck is numbed. The physician inserts a needle and carefully guides it to the nerves of the stellate ganglion. The physician typically uses an x-ray device called a “fluoroscope.” This shows a video image of the needle’s position. Contrast dye may be injected to help confirm that the needle is placed correctly. 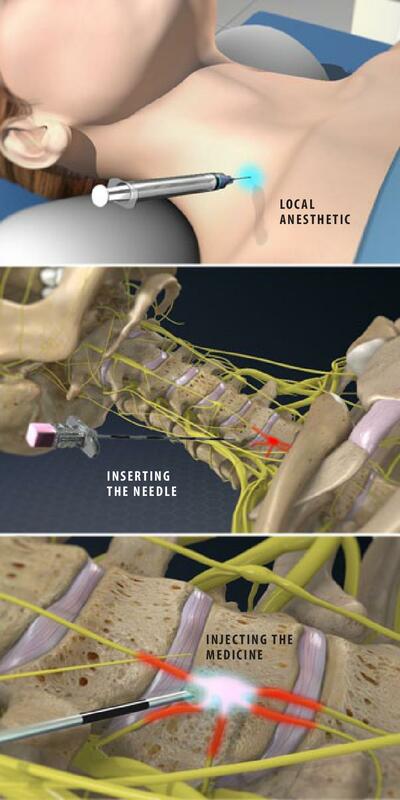 When the procedure is complete, the needle is removed and the injection site is covered with a bandage. You will be monitored for a brief time before you are allowed to go home. After a stellate ganglion block, many people experience some noticeable temporary effects. The arm on the side where you were given the injection may feel warm and tingly. Your voice may be hoarse. You may have nasal congestion, a flushed face and a droopy eye. These effects are normal, and they usually disappear after a few hours. You may need to return for more injections in the future.